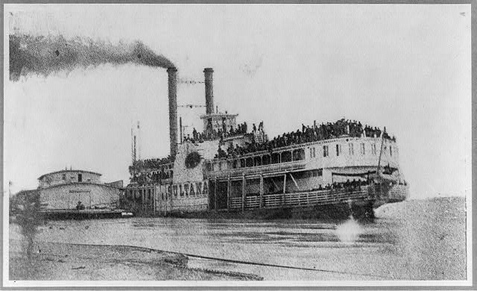 The explosion of the steamboat Sultana on April 27, 1865 in the middle of the night on the Mississippi River near Memphis resulted in what is probably the greatest loss of life in a naval disaster in American history. The ship was rated to carry only about 375 passengers, but nearly 2,200 Union prisoners from Andersonville and Cahaba prisons were crowded onto the boat that fateful night. The Sultana's boilers exploded at 1 a.m. in the morning of April 27 seven miles north of Memphis, flinging men already weakened from their imprisonment into the flooded, icy river. Many prisoners were seriously burned and injured. There are 1,221 verified deaths from existing sources, including Adjutant General (AG) reports. Many Sultana experts put the death toll at 1,500 to 1,800, making the Sultana death toll higher than the Titanic. About 800 survivors were found and taken to hospital in Memphis, but nearly 300 died there from burns and exposure. Many bodies were never found. Men simply floated down the river, past Memphis on to their death.